Horrifying NYE kiss attempt revealed in cringeworthy video. This horrifyingly awkward New Year's Eve kiss is the worst thing we've seen this year. 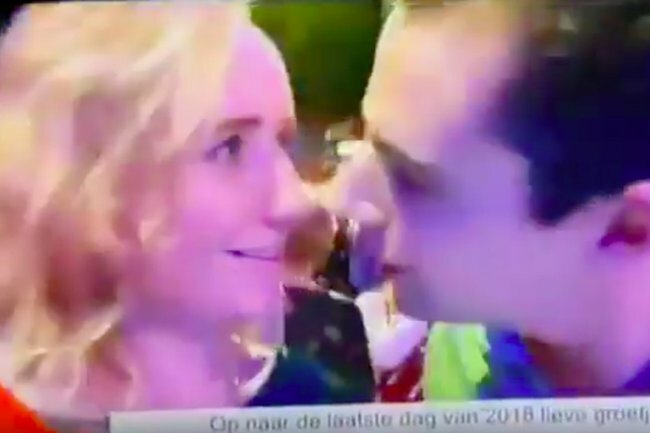 The unnamed man was caught on live TV when he made an incredibly awkward attempt to give the woman next to him a New Year’s kiss. In the cringe-inducing clip, the man leans in open-mouthed (yep, open-mouthed) for a kiss. But before he can steal a kiss, the blonde woman takes a step back, looking both confused and disgusted by his attempt. The excruciatingly embarrassing video ends with the woman staring at the man confused before awkwardly looking at the ground. The failed attempt, which was filmed live on Top 200 Live on Dutch station NPO Radio 2, quickly went viral online on Twitter and Reddit. “I hope your 2019 starts off better than this guy’s,” one Twitter user wrote, sharing the cringeworthy clip. If you’re prone to second-hand embarrassment, you might want to skip watching the below clip. Trust us, it’s really, really painful to watch. The Twitter post has since racked up over 13.2 million views, more than 73,000 retweets and over 288,000 likes. The Twitter user who shared the clip has since clarified that he doesn’t know either person in the video. Dozens of social media users have responded to the painfully awkward clip, with many describing the second-hand embarrassment they felt watching it. “This physically hurts to watch,” one commenter wrote. “This is easily the most awkward thing I’ve seen all year!” another wrote. Why’d he open his mouth????????? But while many cringed over the clip, some commenters praised the woman for turning down the kiss. “Good on her. She didn’t want to be kissed and even though her body language was very clear, he foolishly proceeded,” one woman wrote.